Welcome to the law firm of Berry and Berry, PLLC in the Metropolitan, Washington D.C. area where we specialize in the nationwide legal representation of individuals in security clearance matters before federal agencies. We are security clearance lawyers and take our responsibilities to clients very seriously in attempting to mitigate security concerns that may exist or be in question. Please also visit our main law firm webpage at www.berrylegal.com. We focus on providing legal advice and representation to federal employees and government contractors regarding their security clearances. We represent clearance applicants and holders at all steps of the security clearance process, from legal advice prior to completing the initial clearance questionnaires to the final steps of the appeals process, if needed. We take a non-judgmental approach to security clearance issues. We understand that if examined with enough scrutiny that every person who applied for a security clearance could potentially have security concerns. Our goal is to represent you effectively before security clearance adjudicators, while at the same time understanding that security clearance issues are not always easy to discuss. Discussions with attorneys in the firm are privileged and confidential. 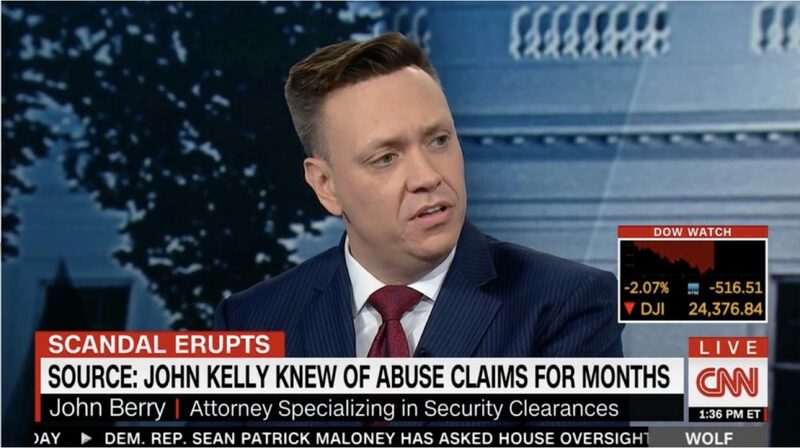 We are also members of the Security Clearance Lawyers Association. Please visit our website, www.berrylegal.com and feel free to contact us at (703) 668-0070 or through our contact page should you wish to schedule a time to discuss your individual security clearance issues. Please visit our security clearance blog where we cover and review legal issues for clearance holders and applicants.